Professor Holland consults at Crows Nest and Westmead. All appointments should be made by calling us on 1300 36 22 78. It is helpful if you can have available the details of the referring doctor and have considered the preferred location for your consultation. Please note: Professor Holland’s Westmead rooms are in the Specialist Medical Centre on Hawkesbury Road, a 15 minute walk from The Children’s Hospital at Westmead. The entire Westmead Campus, including The Children’s Hospital, Westmead Hospital, Westmead Private Hospital and the University of Western Sydney, is currently undergoing major building work with considerable additional construction related congestion likely until 2025. Prior to you consultation, consider who you would like to be present on the day. Whilst siblings and other relatives are welcome, they may distract you and make later recall of important information more difficult. On the day of your appointment, please allow at least 45 minutes to find a parking space and to make your way to the rooms, especially at peak times and in inclement weather. Rail and bus services are close by both rooms and will often prove quicker and more convenient for you. Toilets and a baby change facilities are available on site. For children we have a range of toys available for play, with some magazines and brochures for parents. Whilst every effort had been made to make the rooms as safe and comfortable as possible, we do need you to supervise your child for their own safety and the comfort of other families. New appointments are scheduled for 15 minutes. If your child has a complex problem, more than one problem, you have many questions or you are seeking a second opinion, please let us know at the time of booking your appointment so that we can allocate additional time. This helps us to run on time and is courteous to other families who also have consultations booked on the same day. Please note that extended consultations incur an additional fee. 5. Payment for your consultation fee. We accept cash, cheque, EFTPOS, Visa, MasterCard and American Express. We do not accept Diners Club cards. Providing you have current referral and Medicare card with you, we are able to process your claim at the time of your appointment so that you should receive your rebate direct to your nominated account. If your child requires surgery and you elect to be treated privately, we will provide you with a detailed quotation. We offer known gap cover with most health funds. In order to confirm your booking, we ask that you settle any surgical out of pocket expenses at the time of your consultation. We do our best to be on time, but as with all doctors emergency cases or urgent calls may result in a delay. Please accept our apologies in advance. Please contact us as soon as you are aware that you will not be able to make your appointment. It is helpful if we can have at least two working days’ notice so that we can allocate the time to another family. If you decide not to proceed with a booking for surgery, please advise us directly as soon as possible or at least three working days prior to your booking. Paediatric surgical operating time remains a very scarce resource in our community. Another family will appreciate the opportunity of using the operating theatre time to facilitate the care of their child. 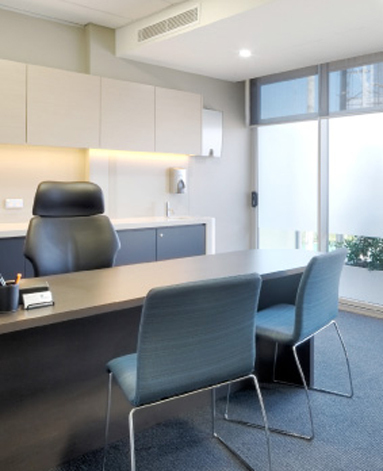 All appointments and enquiries should be made through our Westmead rooms.